Highly sensitive and accurate quantitation of purified dsDNA samples across a broad range of DNA concentrations. The assay is linear between 0.03 ng and 250 ng of dsDNA per assay in microplate format making it the most versatile DNA quantitation assay. What are the differences between the DNA quantitation kits? Which should I choose? AccuGreen™ kits are designed for use with the Qubit® fluorometer. All of the other kits are designed for use with 96-well fluorescence plate readers. Our quantitation kits vary in the concentration ranges of dsDNA that they are able to detect. Some of the kits also have different fluorescence excitation/emission. Visit the DNA Quantitation Kit Technology Page or consult the table below to make your selection. What instruments can I use with your DNA quantitation kits? Do they work on Qubit®? The AccuClear® and AccuBlue® DNA Quantitation kits are designed for use with fluorescence 96-well plate readers. AccuClear®, AccuBlue® NextGen and AccuBlue® High Sensitivity kits require an instrument equipped to read green fluorescence emission (similar to FITC). AccuBlue® Broad Range requires an instrument equipped to read blue fluorescence emission (Ex/Em 350/460 nm). These assays also can be used with fluorometers such as the Qubit® (Thermo Scientific) and QuantiFluor™-P (Promega). However, due to different linear ranges of the assays, not all of these assays are compatible with the pre-programmed DNA quantitation programs on these instruments. For users who own a Qubit® fluorometer, we recommend using our AccuGreen™ kits, which are designed for use on that instrument. The AccuGreen™ High Sensitivity DNA Quantitation kit is designed for use on the Qubit® fluorometer. It can be used in the preprogrammed Qubit® dsDNA High Sensitivity assay, and is a direct replacement for the Qubit® dsDNA HS Assay kit. The AccuGreen™ Broad Range DNA Quantitation kit is designed for use on the Qubit® fluorometer. It can be used in the preprogrammed Qubit® dsDNA Broad Range assay, and is a replacement for the Qubit® dsDNA BR Assay kit. Which kits are the best alternatives for ThermoFishers Quant-iT™ and Qubit® kits? For detection of picogram levels of DNA on a microplate reader, we recommend our AccuBlue® NextGen dsDNA Quantitation Kit (detection range 2.5 pg-3 ng dsDNA) which has higher accuracy and sensitivity than PicoGreen® in a 96-well assay format. Also see our AccuClear® Ultra High Sensitivity dsDNA Quantation Kit, which is a great all-purpose choice: it has high sensitivity with a broad linear detection range (30 pg-250 ng dsDNA). If you own a Qubit® fluorometer, we recommend our AccuGreen™ kits, which were designed for use with the Qubit® fluorometer. AccuGreen™ High Sensitivity dsDNA Quantitation kit is a direct replacement for the Qubit® dsDNA HS Assay kit. AccuGreen™ Broad Range dsDNA Quantitation Kit is a replacement for the Qubit® dsDNA BR Assay kit. Note that the lower limits of kit sensitivity may depend on the detection instrument used. 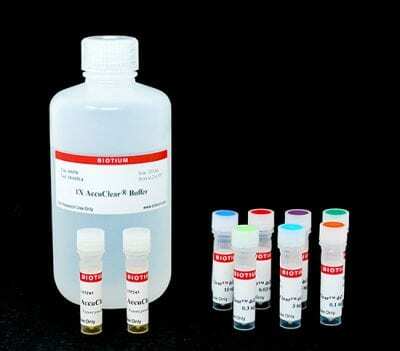 AccuClear® Ultra High Sensitivity dsDNA Quantitation Kit utilizes a novel, next-generation DNA binding dye for highly sensitive and accurate quantitation of purified dsDNA samples across a broad range of DNA concentrations. The assay is linear between 0.03 ng and 250 ng of dsDNA per assay in microplate format, making it the most versatile DNA quantitation assay. Unlike absorbance-based measurements, AccuClear® dye is highly selective for double-stranded DNA over single stranded DNA or RNA. We also sell a stand-alone AccuClear® Quantitation Solution without DNA standards (catalog no. 31027), for users who wish to use their own standards. The AccuClear® dsDNA quantitation assay is designed for use with fluorescence 96-well plate readers equipped with excitation and emission filters for detecting green fluorescence. The unique spectral properties of AccuClear® dye make it especially well-suited for use with instruments with blue LED excitation sources. For DNA quantitation using the Qubit® fluorometer we recommend our AccuGreen™ High Sensitivity dsDNA Quantitation Kit (catalog no. 31066) and AccuGreen™ Broad Range dsDNA Quantitation Kit (catalog no. 31069), which were formulated specifically for that instrument. AccuBlue and AccuClear are registered trademarks of Biotium, Inc. AccuBlue, AccuClear and AccuGreen technologies are covered by granted U.S. and international patents. Qubit and Quant-iT are registered trademarks of Thermo Fisher Scientific. AccuClear® Ultra High Sensitivity dsDNA Quantitation Solution utilizes a novel, next-generation DNA binding dye for highly sensitive and accurate quantitation of purified dsDNA samples across a broad range of DNA concentrations. The assay is linear between 0.03 ng and 250 ng of dsDNA per assay in microplate format making it the most versatile DNA quantitation assay. The AccuBlue® Broad Range dsDNA Quantitation Kit is designed for use with fluorescent plate readers in a 96-well microplate format. The AccuBlue® Broad Range Kit is specific for dsDNA, and can quantify DNA samples in the range of 0.2-200 ng/uL. The AccuBlue® NextGen dsDNA Quantitation Kit provides an unprecedented level of sensitivity in dsDNA detection. The AccuBlue® NextGen dsDNA Quantitation assay is the most sensitive and accurate DNA quantitation method for ultra low amounts of DNA. The AccuGreen™ High Sensitivity dsDNA Quantitation Kit is designed for use with handheld fluorometers such as the Qubit® fluorometer from Thermo Fisher. The AccuGreen™ kit is specific for dsDNA, and can quantify DNA samples in the range of 0.01-10 ng/uL. This double-stranded Calf Thymus DNA is free of RNase activity, and is useful in applications where RNase contamination needs to be avoided. It has been prepared using Biotium's proprietary method to irreversibly inactivate RNase activity, and tested to confirm that there is no RNAse activity remaining. DNA quantitation kit designed for use with handheld fluorometers such as the Qubit® fluorometer from Thermo Fisher. The kit is specific for dsDNA, and can quantify DNA samples in the range of 0.2-100 ng/uL.